HAVANA – Cuba has begun allowing foreign investors to lease government land for up to 99 years, a step toward a future that could be filled with golf courses ringed by luxury villas, beachfront timeshares and vacation homes for well-heeled tourists. But while overseas developers are cheering, some caution that the communist island has been down this road before, embracing foreign ownership with an eye toward bolstering tourism revenues — only to scrap those reforms when the economy improved and profit margins no longer seemed as important as maintaining state control of commerce. A decree that was published as law Thursday loosened property laws enough to allow 99-year leases for foreigners. A measure appearing the following day expanded self-employment, letting Cubans grow and sell small amounts of farm products out of their homes or special kiosks. Large agricultural holdings are state-controlled, but small farmers were already allowed to work their own land. The law will allow more Cubans to do so and let them sell what they produce, but will also make them pay taxes on their profits. The moves are significant as President Raul Castro promises to scale back the state’s near-total dominance of the economy while attempting to generate new revenue for a government short on cash. Still, it’s too early to herald a new Cuba, said John Kavulich, a senior policy adviser for the U.S.-Cuba Trade and Economic Council in New York. “I don’t think it’s going to open a floodgate. I think it may turn on a tap so that people know there’s water,” he said. Far more optimistic was Robin Conners, president and CEO of Vancover-based Leisure Canada, which wants to build hotels, villas and two golf courses on a stretch of beach in Jibacoa, 40 miles (64 kilometers) east of Havana. “We see the times are changing, so to speak,” Conners said. Cuba already allowed leases of state land for up to 50 years with the option to extend them for an additional 25, but foreign investors had long pressed tourism officials to endorse 99-year lease deals to provide additional peace of mind to investors. The longer leases also mean lower interest rates on international banking mortgages, Conners said. “I think this is huge,” he said by phone while vacationing in Paris. Investors in Canada, Europe and Asia have been waiting to crack the market for long-term tourism in Cuba, built on visitors who could live part-time on the island instead of just hitting the beach for a few days. The U.S. bars its companies from doing business with Cuba. The change may also help Cuba embrace golf. Investment firms have for decades proposed building lavish 18-hole courses with luxury housing for foreigners. 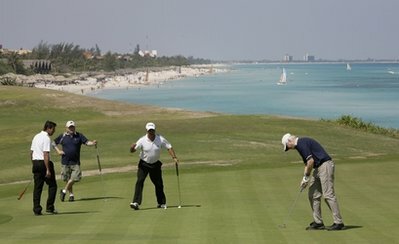 Despite years of grand plans, however, Cuba has just two golf courses and has yet to approve construction of any new ones — though the tourism Ministry says it would like to build 10 more. Andrew Macdonald, CEO of Britain’s Esencia Hotels and Resorts, said his company had planned to start construction last year on the Carbonera Country Club, a $300 million development outside the resort of Varadero, but is still waiting for government approval. In addition to an 18-hole golf course, Macdonald’s plan calls for 800 luxury apartments and 100 villas. While the longer-term leases could reshape international investment in Cuba, meanwhile, allowing more production and sales of agriculture products will likely have far greater impact on ordinary Cubans. The law marks the first major expansion of self-employment since Castro said in an address to parliament Aug. 1 that his government would reduce state controls on small businesses and private enterprise — a big deal in a country where about 95 percent of people work for the state. Cubans already sell fruit, pork, cheese and other items on the sides of highways across the country, fleeing whenever the police happen past. The new measure legalizes such practices by letting Cubans grow whatever they wish and sell it, while bolstering state coffers with new taxes on their earnings. “It’s good, though still something very limited,” Espinosa Chepe said.